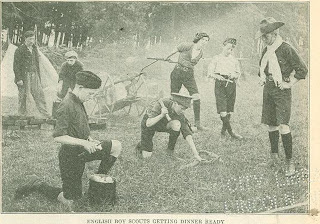 “Be prepared," the motto of the Boy Scout) signifies fully the purpose of the scout move­ment as it is being grafted from the parent English stock, where it first took shape, to that more live and adaptable, but perhaps less sturdy shoot, the Amer­ican boy. Whether it is to be ready in will and training to help an old lady safely across a busy crossing: to give "first aid" to an injured companion; or to repel an invasion by a hostile nation, the American youth may well take as his slogan, "Be Prepared." This does not moan merely gaining a fund of informa­tion from leader, book and nature, but unconsciously developing a resourceful­ness which will always stand him instead, and which our average city-bred boy lacks to a great degree. The American boy used to live in the country, or in close proximity to it, and a healthy environment and nature's school­ing gave him a practical knowledge and a resourcefulness which have brought forth empire-builders. This boy could ride, swim, hunt and skate; he was handy with tools; knew nature's secrets in field and wood; had chores to do. He was self-reliant and well developed in body and brain. Because of a careful rearing in a real home he was respectful and obedient, the right material from which to build a nation, and from which come nation ­builders. There is the danger of our losing this type of boy through the change due to modern social and industrial conditions. Modern standards of living may conduce to a. higher type of civilization, but the adolescent boy, with his many semi-bar­barous instincts, is being forced onward too rapidly, like a hot-house plant, toward and into this stage of refinement, to the exclusion of his natural impulses. His wide interest in nature - persons, beasts, plants at work - is being dwarfed by narrow nature study from books; his per­sonal interest in athletics is being superseded by a mania for "beating" in spectacular contests; and his desire to make things and sec them work is in danger of being smothered by too much theoretical instruction. Likewise the normal boy's natural religious instincts, his altruistic impulses, are too crude and deep-seated to be found and nurtured by many of our modern religious forms and prejudices. Any scheme of ideas that will help bring back to our city boy's life his inher­ent rights and desires of achievement, adventure, observation and knowledge of nature, is well worth careful study. The Boy Scout movement is such a scheme, Although its ideals can better he attained in the country, yet its adaptation to the city has been proved, and is only in its beginnings. Scouting is an educational movement, to he promoted by and in con­junction with other institutions, not an independent organization. Sir Baden-Powell, the originator of the English movement, says: The scheme is not in any way intended to be in opposi­tion to any existing organization. On the contrary, I want amalgamation rather than rivalry, and scouting is only in­tended to be used as an additional attrac­tion by those in charge of boys' organiza­tions of any kind. 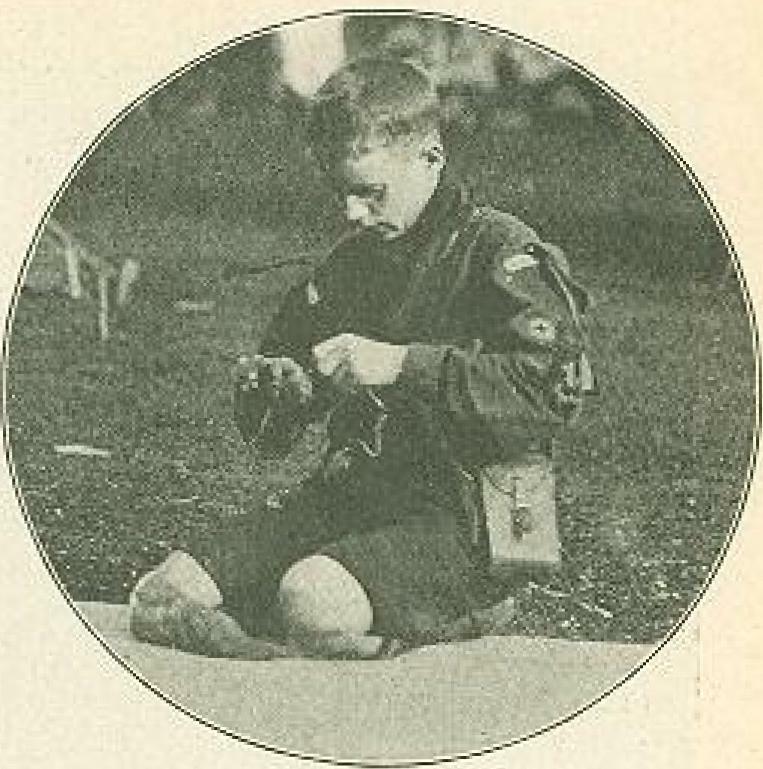 If scouting is taken up by several it may prove a bond between all, Where such organizations do not already exist, it can supply a particularly simple and effective one for catching a number of boys who would otherwise have no hand to guide them," The work of the scouts may be used in connection with boys' clubs, public schools. Sunday-school, church clubs, Young Men's Christian As­sociations, Young Men's Hebrew Associa­tions, Young Men's Catholic Associations, Playground Associations, Boys' Brigades, Settlements, Knights of King Arthur, Knights of the Holy Oran, etc. Meanwhile. Thompson-Seton had con­ceived in this country his "Woodcraft Indian" idea, and the movement had made considerable progress when Seton went to England to start "Woodcraft" there. While in England Sir Baden-Powell and Thompson-Seton met and each contributed to the work of the other, so that the result was the "Boy Scouts," as it is now know. The movement took formal shape in 1908, the handbook on scouting was compiled from material furnished.by both .Baden-Powell and Seton, and the military idea was very much subordinated to the real scouting and woodcraft activities. One year ago the tremendous growth and popularity of the organization in England caused it to “overflow'' to America. It met with a hearty reception here and various "national movements" for scouting, sprang up. Among these was one organized by William Randolph Hearst and promoted by him through his news­papers over the country. 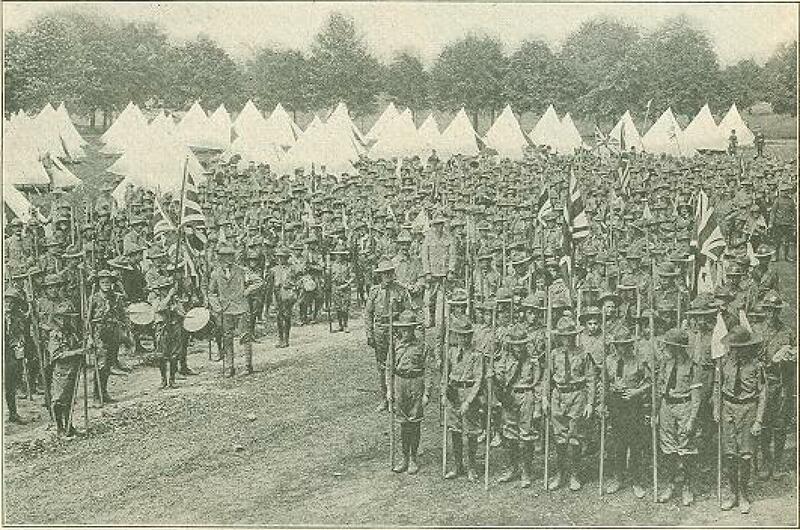 The Thompson­-Seton movement had been here, however, and was slowly but surely taking form, so that all but the "Hearst Scouts" merged with this original American movement. This has now developed into "peace-scouting" to such an extent that the military element is merely a strand in the cable. The large constructive agencies dealing with boys in the country, such as the Play­grounds, Young Men's Christian Associa­tion, Church Clubs, etc., have been foster­ing the "Boy Scouts of America" as this movement is termed. The "Hearst Scouts" or the "American Boy Scouts" was from its beginning promoted largely by military men and savored much of the military. For the past year these two organizations have been growing throughout the country, each standing, for its own ideals and each interesting its own group of men in the attempt properly to reach the boy. 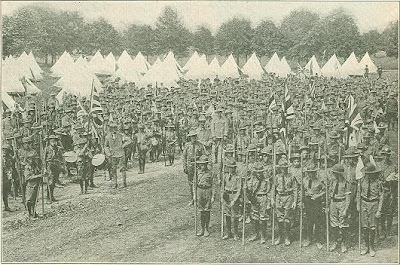 Two independent Boy Scout movements could not continue to exist, however, and the wisdom of the "Boy Scouts of Amer­ica" promoters in interesting the large constructive agencies in the country, and in subordinating the military phase, has resulted in the beginning of a gradual ab­sorption of the "Hearst movement" by them. This process has taken place in Chi­cago, the first place to bring it about, and the city where the Hearst scouts have been the strongest. All patrols of scouts formed by the Hearst movement have been taken over by the City Scout Council of the Boy Scouts of America, and the "Amer­ican Boy Scout" directors have disbanded, to be received into the membership of the Boy Scouts of America, as individuals. This action in Chicago is the beginning of a general movement throughout the country. The above history of the scout move­ment, serves to emphasize the statement that this is not a military organization and that in America the military element in it is a very minor one, "peace scouting" being the objective. There is no military meaning attached to the name scouting. "Peace scouting" comprises the attributes of frontiersmen in the way of resourceful­ness and self-reliance and the many other qualities which make them men among men. There is no intention of making the lads into soldiers or of teaching them blood-thirstiness. But under patriotism they will be taught that a citizen must be prepared to take, his fair share among his fellows in the defense of the homeland against aggression, in return for the safety and freedom enjoyed by him as an in­habitant. He who leaves this duty to others to do for him is neither playing a plucky nor a fair part. The story of the original development of scouting, and its present status in the country serves further to emphasize an­other very important point, which is proving an essential factor in its progress in America. This is the fact that the pro­moters are not trying to make the Boy Scouts an entirely independent movement, but are trusting interested institutions to do the direct work with the boys and fur­nish the local leadership. This is as it should be, and insures the proper elasticity and adaptability. Let us sum up and express concisely, yet completely, the ideals of "boy scout­ing." The Boy Scouts is an organization, the purpose of which is character-build­ing, for boys between the ages of twelve and eighteen. It is an effort to get boys to appreciate the things about them, and to train them in self-reliance. manhood and good citizenship, It is "peace scout­ing" these boys engage in living as much as possible out of doors; camping, hiking and learning the secret of the woods and fields. The movement is not essentially military, but the military virtues of dis­cipline, obedience, neatness and order ere scout virtues. Endurance, self-control and an effort to help someone else are scout objectives. Every activity that lends itself to these aims is good scout-craft. The aim of the Boy Scouts is further to supplement the various exist­ing educational agencies, arid to promote the ability in boys to do things for them­selves and others, The method is summed up in the term scout-craft, and is a combination of observation, deduction and handiness - or the ability to do. Scout-craft consists of first aid, life-saving, tracking, signaling, cycling, nature study, seamanship and other instruction. This is accomplished by games and team play, and is pleasure, not work, for the boy. The only equipment it needs is the out-of-doors, a group of boys and a leader. An organization of this kind would fail in its object if it did not bring its mem­bers to a knowledge of religion, but the usual fault in such cases is the manner in which this is done. If religion were treated more as a matter of every-day life and without sectarian bias, it would not lose its dignity end would gain a hold. The definition of religious observance is purposely left vague in the handbook, in order to give a free hand to organizations and units making use of it, so that they can give their own instructions in the matter. Here lies the essential value of the proper scout leader or master. The scout master is the adult leader of patrols. He must have a deep interest in boys, be genuine in his own life, have the ability to lead and command the boy's respect and obedience and possess some knowledge of a boy's ways, but need not be an expert on scout-craft, The good scout master will discover experts for the various activities. Like every new Movement in America, the "Boy Scouts of America" must prove its permanence and worth through its adaptability to the American characteris­tics, and it ability to cooperate with and supplement other forces. Its adaptability seems already to have been established, be­cause of the large numbers of boys en­rolled and the quality of the leadership secured. The American Boy is naturally drawn to any activity that demands stren­uous outdoor life, daring and variety, and scouting has all of these, The permanence and value of the movement depend upon its maintaining, with ever-increasing effi­ciency as paramount issues, the educative and the character-building elements, The method of promoting these two phases of work is being left, wisely, in the hands of existing agencies such as playgrounds, settlements, clubs, etc. Direct leadership and specific methods must he furnished by these institutions. This very fact safe­guards the movement, making it a cooperative and supplemental organization. However, to insure a degree of uniform­ity and properly to standardize "boy scouting," some method and law are laid down by a national council to guide the progress of the movement. Two of these features will show the real worth of the organization; the method or system of degrees or honors, as illustrating the educational basis; and the scout law, as show­ing clearly the character-building quality of the movement. Tenderfoot - A boy on joining the Boy Scouts .must pass a test in the following points before taking the pledge: 1. Know the scout's laws and signs and salute. 2. Know the composition of the national flag and the right way to fly it. 3. Tie four out of the following knots: Reef, sheet-bend, clove-hitch, bowline, middleman's, fisherman's, sheep-shank. He then takes the scout's pledge and is enrolled as a Tenderfoot, and is entitled to wear the buttonhole badge. Second-class Scout - Before being awarded the second-class scout's badge a tenderfoot must pass the following tests: 1. Have at least one month's service as a tenderfoot. 2. Elementary first aid and bandaging. 3. Signaling, elementary knowledge of semaphore or Morse alpha­bet. 4. Track half a mile in twenty-five minutes; or, if in a town, describe satis­factorily the contents of one store window out of four, observed for one minute each. 5. Go a mile in twelve minutes at "scout's pace." 6. Lay and light a fire, using not more than two matches. 7. Cook a quarter of a pound of meat and two potatoes without cooking utensils other than the regula­tion billy. 8. Have at least twenty-five cents in a savings bank. 9. Know the six­teen principal points of the compass. First-class Scout - Before being awarded a first-class scout's badge a scout must pass the following tests, in addition to the tests laid down for second-class scouts: 1. Swim fifty yards. (N. B.- This may be omitted where the doctor cer­tifies that bathing is dangerous to the boy's health, in which ease. he must run a mile in eight minutes, or perform some equiva­lent. selected by the scout master.) 2. Must have fifty cents at least in the savings bank. 3. Signaling, Send and receive a message either in semaphore: or Morse, six­teen letters per minute. 4. Go on foot, or row a boat, alone, to a point seven miles away and return again; or, if conveyed by any vehicle or animal, go to a distance of fifteen miles and back, and write a short report on it. It is preferable that he should take two days over it. 5. Describe or show the proper means for saving life in case of two of the following accidents (allotted by the examiners) Fire, drown­ing, runaway carriage, sewer gas, ice breaking; or bandage an injured patient, or revive apparently drowned person. 6. Cook satisfactorily two out of the follow­ing dishes, as may be directed: Porridge, bacon, hunter's stew; or skin and cook a rabbit, or pluck and cook a bird. Also make a "damper" of half a pound of flour, or a "twist" baked on a thick stick. 7. Read a map correctly; and draw an in­telligent rough sketch map. Point out a compass direction without the help of a compass. 8. 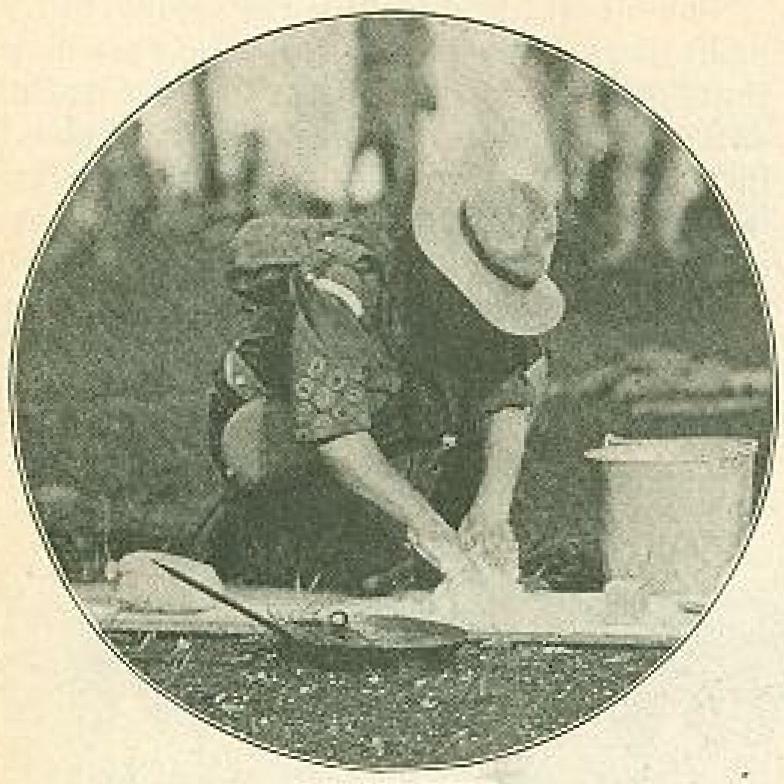 Use an ax for felling or trimming light timber; or, as an alternative, produce an article of carpentry or joinery or metalwork, made by himself satisfac­torily. 9. Judge distance, size, numbers and height within twenty-five per cent error. 10. Bring a Tenderfoot trained by himself in the points required for a Tenderfoot. 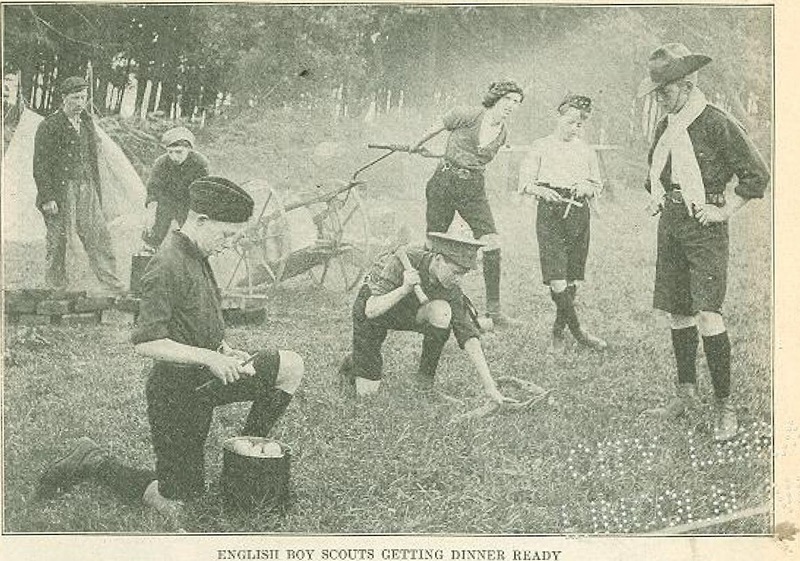 The foregoing scheme certainly has dis­tinct progressive educational value, and with a national body and a city scout council such as Chicago has just formed, to correlate; effort and uphold the high standards established the scout movement from the educational standpoint should be of permanent value. The character-building element in scouting is insured by the following scout law, laid down by the national council, if, as in the educational phase, the standards are carefully maintained. Local scout officials and the leaders of boys in the various insti­tutions connected with which patrols are formed must be responsible for this the scout law is the creed of the "Boy Scouts of America,"
"1. A scout's honor is to be trusted. If a scout were to break his honor by telling a lie, or by not carrying out an order exactly when trusted on his honor to do so, he may be directed to hand over his scout badge, and never to wear it again, He may also be directed cease to be a scout. "2. A scout is loyal to his country, his officers, his parents and his employers. He must stick to them through thick and thin against anyone who is their enemy or who even talks badly of them. "3. A scout's duty is to be useful and to help others. He must be prepared at any time to save life, or to help injured persons. And he must try his best to do a good turn to somebody every day. “4. A scout is a friend to all, and a brother to every other scout, no matter to what social class the other belongs. “5.A scout is courteous. That is, he is polite to all, but especially to women and children, and old people and invalids, cripples: etc. And he must not take any reward for reward for being helpful or courteous. “6. A scout is a friend to animals. He should save them as far as possible from pain, and should not kill any animal un­necessarily. Killing an animal for food is allowable. "7. A scout obeys orders of his parents, patrol leader or scout master without ques­tion. “8. A scout smiles and whistles under all circumstances. When he gets an order he should obey it cheerily and readily, not in a slow, hang-dog sort of way; Scouts never grumble, at hardships, nor whine at each other, nor swear when put, out. The punishment for swearing or using bad lan­guage is, for each offense, a mug of cold water to be poured down the offender's sleeve by the other scouts. It was the punishment invented by the old scout, Captain John Smith, three hundred years ago. Much more could be written regarding fundamental principles of scouting for boys, but only one other matter need be mentioned here, that is the training of scout leaders. As with every other move­ment dealing with boys, adequate, trained leadership is the first requisite - strong, virile men not only acquainted with and interested in scouting and in boys, but men trained to teach scouting with all it im­plies. Groups of such leaders are being gotten together by local councils and by institutions which have become interested in the movement! A manual on scouting has been prepared, and another, brought up to date, will soon be off the press, issued by the National Council in New York City. This book, with practical and normal work, is furnishing a course of instruction for scout-masters, This should always be the first step in organizing scout­ing in any community. The educational and moral value of scouting will be main­tained in no other way. These leaders, in turn, will then train older boys as patrol leaders, thus giving the older boy the op­portunity of Service among the younger lads. This latter may prove to be the most valuable and far-reaching phase, of the whole boy scout movement. The World To-Day Magazine. 1911.